It's been awhile since I showed you our closet and how our family of six fits all their clothes in packing cubes. Now that we have that mess organized, I’d love to show you the rest of our bathroom! This is not a Pinterest bathroom! I repeat...THIS IS NOT A PINTEREST BATHROOM! While we think tiled bathrooms are really cool and crazy beautiful, they just aren’t practical for our lifestyle. If this Airstream was set on land and never moved, heck yes we’d tile it! But that’s not our plan, not yet anyway. We are constantly going down crazy bumpy roads and putting our Airstream through quite a bit of stress. I don’t know how well tile would hold up to that kind of pressure, but I’m guessing not so well. I could be wrong though. So, let’s show you what we have in here! Keep in mind, the standing space in here is just 4 feet by 3 feet so getting pictures is a bit tricky, but I’ll do my best! As soon as you walk into our bathroom, our closet is on the right side. It has all of our clothes inside (hallelujah! ), as well towels and toiletries. The very bottom of this cabinet is where our water heater is. We also store extra rolls of paper towels or toilet paper next to it. On the side of the closet we hung two towel hooks and a bit further down is the toilet paper holder. On the aluminum wall we added two Command broom holders. One for the mop, one for our broom. I'm sure you noticed our Nature's Head Composting Toilet! We LOVE not having a black tank. We were able to convert our black tank (yes we bought a new one) to a gray tank, and we added a second gray tank! This allows us to stay out boondocking for longer periods of time! Have we mentioned how much was love boondocking? The only thing I would do different with the toilet is to plumb the urine diverter to go directly to our gray tank. It would be nice for Jonathan not to have to do the 'walk of shame': carrying his family's urine to dump each day... So if you're installing a composting toilet...PLUMB THE PEE! 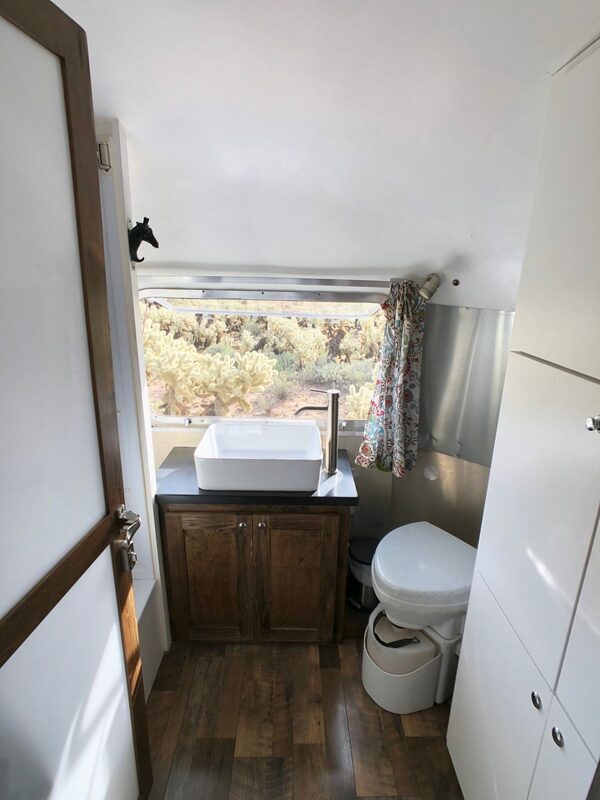 Next to the composting toilet is our sink/vanity. If we could do this again, we would search for a much smaller sink. It’s overkill, but no plans to change it anytime soon. Under the sink is mainly just the plumbing. We do have a few things stored here such as our hair clippers (I cut everyone’s hair), hair dryer, extra toilet paper and some cleaning supplies. Nothing too exciting. To the left is our shower! Yes, we use it (unless we’re at a campground with nice showers). Now, this is not a fancy shower but you know what? It works! We wanted to keep it simple and light weight and we were able to do both! The best thing we did in here was this extendable shower bar! You simply pull it out to create more room when taking a shower, then push it back in when you're done so it's out of the way! It's the best! We also love saving water with our EcoCamel Shower head. This thing is awesome! It takes air in through a small intake hole and adds water pressure so you're using less water! Oh, and do you see the little magnet at the base of the shower wall? That's to hold our door in place! When the windows are open, it's nice to have the bathroom door open for airflow. We bought this magnetic door stop and it's so great for keeping any door propped open! On the far side of the shower and near the vanity, we left this space open so that we could hang a clothes hamper here. We just added enough hooks so that the bag stays open and once a week, when it’s full, we head to the laundromat! Also along this wall where the dirty clothes are stored, we installed toothbrush holders! They each hold 3 toothbrushes which makes them perfect for our family! We also added two hooks to the top of this wall for our bath towels. Next to the left of the shower we have this tiny little storage area. We call it the guitar closet. This space was left open incase we ever need to (not so easily) access the plumbing for the shower here. Just in case! This is where we keep Jonathan’s guitar and 2 ukulele’s and our other set of curtains! And you probably noticed, we have two more towel hooks on this side of the shower, and a long dark blue curtain. This was added as a privacy curtain. Because we do have a door that allows light through, it also allows shadows, so we pull this over the door for added privacy if we need it! It also kind of closes off the guitar closet. Oh! Did you notice our measuring ruler? We’ve had this since Jax was a baby. I used to make them for friends and family. I think it’s such a treasure that we were able to fit it in here. This is literally the only place it would fit. We had to cut off 4 inches from the top, but it works! So fun for the kids to record their height throughout the years. Well, I think that about covers our tiny bathroom! It’s small, but we are very happy with how it turned out! I hope this helps you get a better feel for our space in here! It may be tiny, but we love this little place we get to call home! Thanks to Moment Lens! These shots were made possible by Moment Wide! We LOVE their lenses for our iPhones! You should totally check them out!